Definition at line 101 of file rpcdcep.h. Definition at line 109 of file rpcdcep.h. Definition at line 106 of file rpcdcep.h. Referenced by process_request_packet(), RPC_RegisterInterface(), and RpcServerRegisterIf3(). Definition at line 111 of file rpcdcep.h. Definition at line 104 of file rpcdcep.h. 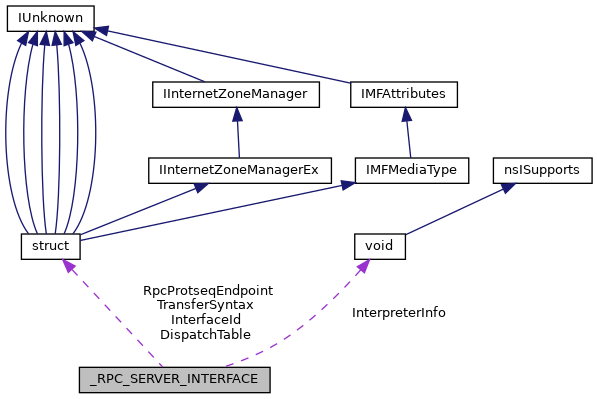 Referenced by epm_register(), NdrContextHandleInitialize(), NdrServerContextNewMarshall(), NdrServerContextNewUnmarshall(), RPC_RegisterInterface(), RPC_UnregisterInterface(), RpcEpUnregister(), RPCRT4_find_interface(), RpcServerRegisterIf3(), RpcServerUnregisterIf(), and s_context_handle_test(). Definition at line 110 of file rpcdcep.h. Definition at line 103 of file rpcdcep.h. Definition at line 108 of file rpcdcep.h. Definition at line 107 of file rpcdcep.h. Definition at line 105 of file rpcdcep.h. Referenced by epm_register(), RpcEpUnregister(), RPCRT4_find_interface(), and RpcServerRegisterIf3().